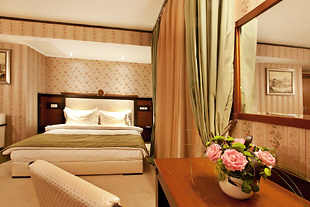 Best Western Plus Bristol Hotel offers 40 elegant rooms Comfort type and 4 suites with a unique original design. Solved in different colors: burgundy, pastel green, chestnut brown mixture and it emphasizes the individual transmission of the hotel. The style of furniture has been known since the beginning of XIX century in England as "Modern Style", and in France "Art Nouveau" and shows sophistication, exquisite detail and refinement. Quality of service requirements is the Best Western hotel chain, which includes - 24 hours room service, breakfast in the price, Wi-Fi, TV "SONY" with 100 digital channels, richly stocked mini-bar, central air conditioning, telephone, electronic safe and piccolo with mrepresentative species. The dexterous choice of furniture, mahogany and elegant wallpaper motives with floral elements create an interior with a sense of a boutique in every room type Comfort in the hotel. 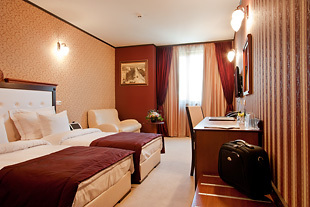 Those guests who choose to stay at Comfort plus room in Sofia Best Western Plus Bristol Hotel will encounter additional facilities and comfort. Amiable atmosphere and discreet luxury await the guests, who preferred our Junior Suite in Sofia Best Western Plus Bristol Hotel. 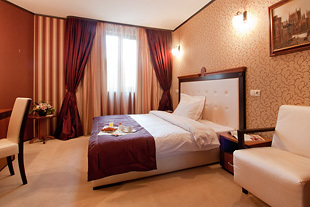 For sophisticated and demanding guests seeking a bit more space when traveling, Best Western Plus Bristol Hotel in Sofia offers the Deluxe Suite.